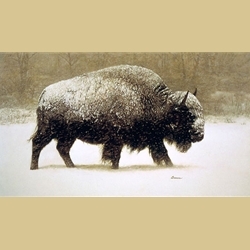 Buffalo In Storm by James Bama. Ask James Bama why he went into Western art and he will tell you quite plainly: he didn’t. “Norman Rockwell lived in New England and so he painted small town scenes and harbors. I happen to live out West, so I paint the Indians, ranchers and landscapes I see.” Bama’s portraits of today’s denizens of the West are thoroughly modern, but their occupations, dress and spirit echo those of their predecessors centuries ago. More than any other animal, the buffalo embodies the rugged tenacity required to survive on the frontier.The day Bama encountered this buffalo, the snow was fourteen inches deep and the animal’s coat and hooves were crusted with ice, but still the animal ventured on.This evocative winter scene follows in the footsteps of the immensely successful Chuck Wagon in the Snow; Old Saddle in the Snow and Old Sod House.